Imatest SFRreg performs highly automated measurements of sharpness (expressed as Spatial Frequency Response (SFR), also known as Modulation Transfer Function (MTF)) and Lateral Chromatic Aberration from images that contain registration mark patterns (circles that contain two light and two dark quadrants). 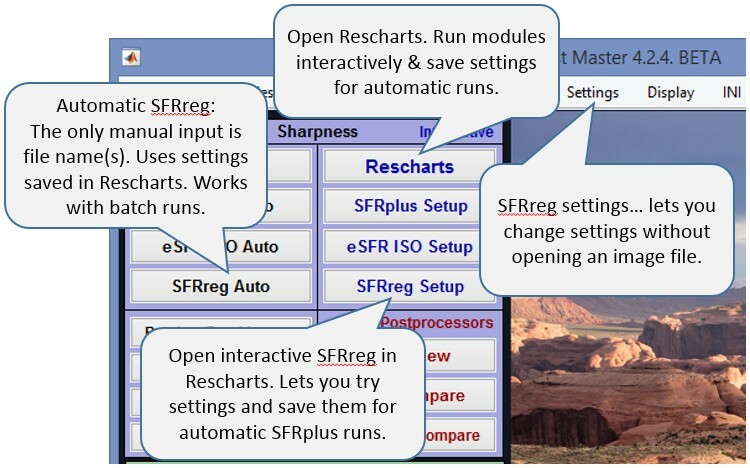 This document shows how to run SFRreg in Rescharts and how to save settings for automated runs. Part 1 introduced SFRreg and explained how to obtain and photograph the chart. Part 3 illustrates the results. the Imatest folder (typically C:Program files\Imatest\vm.n\Edition (where m.n is the version, e.g., 4.2, and Edition can be Master, Image Sensor, etc.) in English language installations). SFRreg operates in two modes: interactive/setup and automatic. To initiate an interactive SFRreg run (in Rescharts), press Rescharts then 10. SFRreg or press the Interactive/Postprocessors dropdown menu then SFRreg setup. This opens a dialog box for reading an SFRreg file; pressing Rescharts is more general; it lets you open any Rescharts module. Either of these buttons allows you to analyze an SFRreg image, examine detailed results interactively, and save settings for the highly automated SFRreg auto runs (or the even more automated Imatest IT EXE or DLL versions). SFRreg should be run at least once interactively prior to the first SFRreg auto run. SFRreg settings can also be updated by pressing Settings, SFRreg Auto settings from the Imatest main window. The portion of the Rescharts window used for opening files is shown on the right. You can open a file by clicking on Read image file if the correct chart type is displayed, or by selecting a Chart type. One or more files may be selected, as shown below. If you select multiple files, they can be combined (averaged), and you’ll be given the option of saving the combined file. The folder saved from the previous run appears in the Look in: box on the top. You are free to change it. The file name from the previous run is displayed at the bottom. You can open a single file by simply double-clicking on it. You can select multiple files for combined runs (for interactive or SFRreg auto runs) or for batch runs (for SFRreg auto-only) by the usual Windows techniques: control-click to add a file; shift-click to select a block of files. Then click Open. Three image files are highlighted. Large files can take several seconds to load. Multiple file selection Several files can be selected in Imatest Master using standard Windows techniques (shift-click or control-click). For SFRreg interactive (Rescharts) runs, files can be combined to reduce noise or (in some instances) observe the effects of camera shake or image stabilization. For SFRreg Auto runs, you can run large batches of images. The multi-image dialog box gives you the option of saving the combined file, which will have the same name as the first selected file with _comb_n appended, where n is the number of files combined. When the file (or files) have been opened, the SFRreg setup window, shown below, appears. This window allows you to select groups of regions (ROIs; shown as violet rectangles) for analysis. It also lets you select the size of the regions, whether to analyze vertical or horizontal edges, and much more. Pressing More settings on the left opens the SFRreg More settings, which allows you to select additional settings that affect the calculations and display. 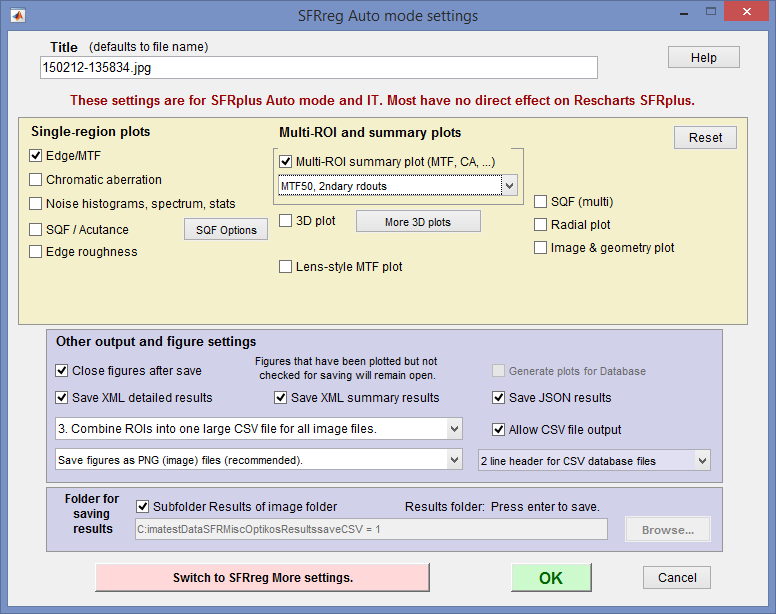 Pressing Auto mode settings lets you select the output figures and files (for SFRreg auto mode runs). Gamma Assumed Gamma (contrast) of the chart. Has a small effect on the MTF results. Default is 0.5. Overwritten if the Use for MTF checkbox (below Chart contrast) is checked. Gamma is described in more detail below. Channel Select channel to analyze: R, G, B, Y, R-only, G-only, B-only, Y-only. (Y is Luminance channel). Use one channel only to speed up calculations or where other channels are dark or may not contain valid data. Selecting one channel-only can significantly speed up calculations. (for gamma calc.) Chart contrast– for the contrasty squares (i.e., most of them). Used to estimate gamma from the image. Use for MTF (Checkbox, normally unchecked) When checked, the gamma derived from the chart is used for the MTF calculation. This may result in a small improvement in accuracy. # of SFRreg targets Let the algorithm automatically detect the number of SFRreg targets in the image or set the number for increased speed and accuracy. More settings Open the SFRreg More settings window, shown below. Auto mode settings Open the SFRreg Auto mode settings window, shown below, for controlling SFRreg auto. Selects which regions (ROIs) to analyze. Registration marks are located automatically. Choices below. These are particularly important settings. Speedup (checkbox) Speed up the run by eliminating some calculations that many users don’t require, including SQF/Acutance, noise statistics and histograms. ROI size Slider that determines the size of the ROI. Use the largest value that keeps a save distance from edges of squares and top and bottom bars. May need to be reduced where distortion is severe. Crop borders Allows borders to be cropped to remove interfering patterns that might otherwise be included in the image. This button is tinted pink whenever the image is cropped. (below ROI size slider) Width of ROI selection. Normal width for the standard rectangular ROI. Choose Wider or Widest for very fuzzy edges, for enhanced noise analysis, or for more extended low frequency response. Title Title. Defaults to file name. You can add a description. Help Open this web page in a web browser. Save settings (for use in auto SFRreg), but do not continue with run. OK Save settings and continue with run: Calculate results for all selected region. You will be able to view results interactively. After you’ve finished making settings, click OK to save settings and continue with the run. You can Click Save settings to save the settings without continuing. More settings is pressed in the SFRreg setup or Rescharts windows. Settings, SFRreg settings is pressed in the Imatest main window, then More settings is pressed in the SFRreg setup window. The settings are read from the imatest-v2.ini file, and saved when OK is pressed. Settings are similar to settings in the SFR input dialog box and also the SFRplus and eSFR ISO More settings windows with several settings removed. This window is divided into sections: Title and Help on top, then Display options, Settings, Optional parameters, and finally, OK or Cancel at the bottom. Help opens a browser window containing a web page describing the module. The browser window sometimes opens behind other windows; you may need to check if it doesn’t pop right up. Display options (below Plot) contains settings that affect the display (units, appearance, etc.). 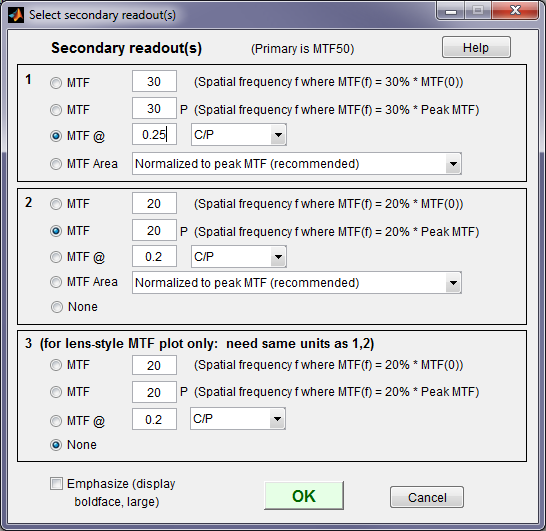 MTF plot units selects the spatial frequency scale for MTF plots for for the summary plot. Cycles/pixel (C/P), Cycles/mm (lp/mm), Cycles/inch (lp/in), Line Widths per Picture Height (LW/PH), and Line Pairs per Picture Height (LP/PH) are the choices. (Note that one cycle is the same as one line pair or two line widths.) If you select Cycles per inch or Cycles/mm, you must enter a number for the pixel size— either in pixels per inch, pixels per mm, or microns per pixel. For more detail on pixel size, see the box below. Maximum MTF plot frequency selects the maximum display frequency for MTF plots. The default is 2x Nyquist (1 cycle/pixel). This works well for high quality digital cameras, not for imaging systems where the edge is spread over several pixels. In such cases, a lower maximum frequency produces a more readable plot. 1x Nyquist (0.5 cycle/pixel), 0.5x Nyquist (0.25 cycle/pixel), and 0.2x Nyquist (0.1 cycle/pixel) are available. Secondary readout controls the secondary readout display in MTF plots. The primary readout is MTF50 (the half-contrast spatial frequency). Two secondary readouts are available with several options. The first defaults to MTF30 (the spatial frequency where MTF is 30%). The third is used only for Lens-style MTF plots. you select this button, the pixel spacing should be specified in the Cycles per… line in the Plot section of the input dialog box, shown above. A reminder message is displayed if the pixel spacing has been omitted. Line spread function (LSF) is the derivative of the linear edge profile. MTF is the fast fourier transform (FFT) of the LSF. Settings affect the results as well as the display. Speedup Speed up calculatons by eliminating some calculations that many users don’t require, including noise statistics and histograms. Checking Speedup can significantly speed up calculations. Edge roughness Calculate edge roughness (for inclusing in CSV output). Slows calculations slightly. Required if Edge roughness plot is to be displayed. MTF noise reduction (mod apod) Reduce noise using the modified apodization technique. Improves MTF accuracy, especially with noisy images, but not an ISO standard calculation. Generally recommended. where Y = 0.3*R + 0.59*G + 0.11*B. R, G, and B color channels can also be selected. Selecting one channel-only can significantly speed up calculations and may help in rare instances where bad data in one channel causes a crash. Gamma (the average slope of log pixel levels as a function of log exposure for light through dark gray tones) is used to linearize the input data, i.e., to remove the gamma encoding applied in the camera or RAW converter. It defaults to 0.5 = 1/2, which is typical of digital cameras, but may be affected by camera or RAW converter settings. Small errors in gamma have little effect on MTF measurements (a 10% error in gamma results in a 2.5% error in MTF50 for a normal contrast target). Gamma should be set to 0.45 or 0.5 when dcraw is used to convert RAW images into sRGB or a gamma=2.2 (Adobe RGB) color space. It is typically around 1 for raw images that haven’t had a gamma curve applied. If gamma is set to less than 0.3 or greater than 0.8, the background will be changed to pink to indicate an unusual (possibly erroneous) selection. Wavelength (um) for diffraction-limited MTF plot. If a number is entered (0.555 um is the default for visible light systems) and pixel spacing is also entered, the diffraction-limited MTF is displayed on the MTF plot and the diffraction-limited edge or Line Spread Function (cross-section of Airy disk) is shown on the edge plot as a faint dashed line. Zone weights Weights of the center, part-way, and corner zones. Used for calculating weighted means of key results, displayed in the Multi-ROI and 3D plots. The defaults of 1 (center), 0.75 (part-war), and 0.5 (corners) are for typical pictorial photography; corners should probably be given more weight for technical photography. Reset restores the settings in SFRreg More Settings to their default values. Additional parameters (all optional) for Excel .CSV output contains a detailed description of the camera, lens, and test conditions. EXIF data is entered, if available, but can be overridden by manual settings. Description & settings is particularly useful for annotating the test system (it is displayed in MTF Compare).These settings are optional but can be useful when several tests are run for different lenses, focal lengths, apertures, or other settings. The settings are displayed next to the MTF plots. They are saved and reused in subsequent runs for files with the same pixel dimensions. If EXIF data is available (currently, only in JPEG files) it overrides the saved settings. The Reset button clears all entries. Imatest’s automatic detection routines work hard to detect SFRreg targets in an image regardless of size, lighting, distortion, and their placement confusing, busy scenes. However, many real-world test setups will contain scene content that could be mistaken for registration mark targets. This is especially true when the targets are low contrast and the scene is high contrast (containing light and/or dark areas more extreme than the light/dark areas of the SFRreg mark). The following options can help guide SFRreg detection in the case that auto-detection selects too few targets or mis-identifies scene content as a test chart. The following options should be left at their default values if auto-detection is working on your images, as (in general) they will increase runtime. Minimum SFRreg mark diameter: Set this value, in pixels, to guide the routine to disregard confusing scene content smaller than your SFRreg targets if it is having difficulty doing so by default. Maximum SFRreg mark diameter: Set this value, in pixels, to guide the routine to disregard confusing scene content larger than your SFRreg targets if it is having difficulty doing so by default. Contrast Robustness: SFRreg targets that have dynamic range (light area/dark area contrast) significantly smaller than the dynamic range of the rest of the scene will be more difficult to detect. Select from various levels of robustness to low-contrast charts with this menu, at the cost of increased runtime. Rotation Robustness: SFRreg targets with a -15 to +15 degree rotation are favored by the detection algorithm (in accordance with idea slanted edge rotation for SFR analysis). If targets rotated by a greater amount are not detected, you may use this option to set various levels of robustness to different rotations, at the cost of increased runtime. When entries are complete, click OK to return control to the SFRreg setup window or to save settings and return to the Imatest main window. When all entries are complete, click either Save settings, OK, or Cancel. Save settings saves the settings for use in automated SFRreg runs, which can be initiated from the SFRreg Auto button in the main Imatest window. OK saves the settings then calculates results for interactive viewing. A sequence of Calculating… boxes appear to let you know how calculations are proceeding. When calculations are complete, results are displayed interactively in the Rescharts window, as shown below. Auto mode settings is pressed in the SFRreg setup window. More settings is pressed in the Rescharts window, then Switch to SFRreg Auto mode setup is pressed in the More settings window. Settings, SFRreg Auto settings is pressed in the Imatest main window. The upper box allows you to select single and multi region figures to be plotted and saved in SFRreg auto output. For the most part they are self-explanatory. Note that all plotted figures are saved. When 3D plot is checked, SFRreg auto plots the last 3D plot displayed in Rescharts unless the More 3D plots button has been pressed and one or more plots has been selected. More 3D plots will be displayed in pink in this case. This allows several 3D plots to be displayed and saved by SFRreg auto. Close figures after save should be checked if a large number of figures are to be displayed. It prevents a buildup of figures, which can slow processing. Figures can be saved as PNG or FIG files. PNG files (a losslessly-compressed image file format) are the default— they require the least storage. Matlab FIG files allow the data to be manipulated– Figures can be resized, zoomed, or rotated (3D figures-only), but FIG files should rarely be used because they can be huge. PNG files are preferred if no additional manipulation is required. A CSV summary file is saved for all runs. An XML file is saved if Save XML results is checked. You can select either Save CSV files for individual ROIs or Save summary CSV file only (the summary file is always saved). Save folder determines where results are stored. It can be set either to subfolder Results of the image folder or to a folder of your choice. Subfolder Results is recommended because it is easy to find if the image folder is known. 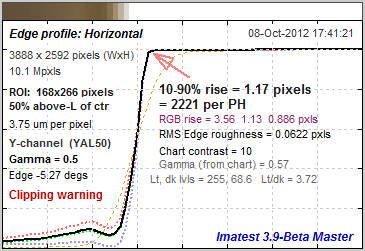 A Clipping warning is issued if more than 0.5% of the pixels are clipped (saturated), i.e., if dark pixels reach level 0 or light pixels reach the maximum level (255 for bit depth = 8). This warning is emphasized if over 5% of the pixels are clipped. Clipping reduces the accuracy of SFR results. It makes measured sharpness better than reality. The percentage of clipped pixels is not a reliable index of the severity of clipping or of MTF measurement error. For example, it is possible to just barely clip a large portion of the image with little loss of accuracy. The plot on the right illustrates strong clipping, indicated by the sharp corner near the “shoulder” on the black line. The MTF measurement is better than reality. The absence of a sharp corner indicates that there is little MTF error.Clipping can usually be avoided with a correct exposure— neither too dark nor light— and by avoiding high contrast targets (like the old ISO-12233 chart). The maximum recommended edge contrast is 10:1; 4:1 contrast (recommended in the upcoming revision to the ISO-12233 standard) is even better. Low-contrast targets are more reliable overall: in addition to better exposure latitude (reduced risk of clipping), they tend to have less sharpening in cameras with variable signal processing, and MTF results are less sensitive to errors in estimating gamma. 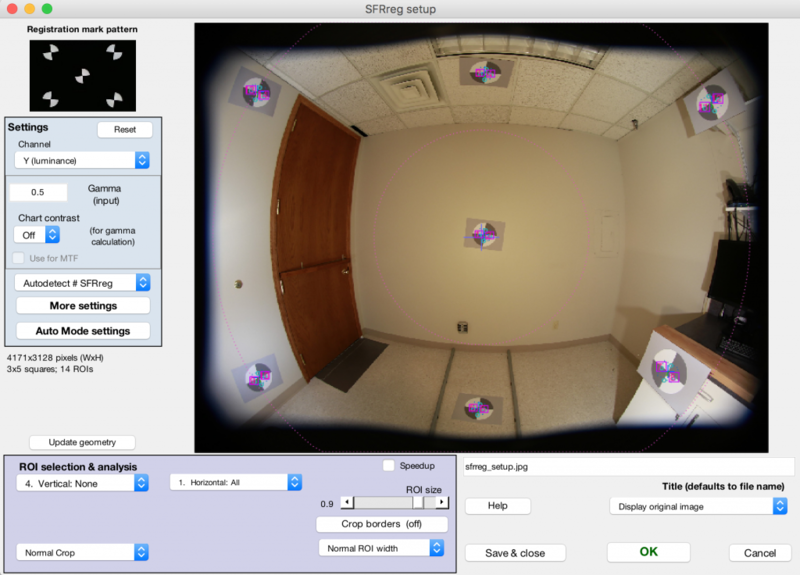 SFRreg analyzes images of registration mark patterns, which may be obtained from the Optikos Meridian compact projection system (where the images may be focused at infinity) or from an array or printed patterns, which can work with extreme wide angle fisheye lenses. There should be few or no interfering patterns (resembling registration marks) outside the registration mark charts. Lighting should be even and glare-free. Lighting and alignment recommendations are given in The Imatest test lab. parameters to be adjusted and saved for later use in the automatic version of SFRreg, which is opened by pressing Fixed modules (dropdown menu), SFRreg Auto in the Imatest main window. results (listed above) to be examined interactively in the Rescharts window. Pixel size is closely related to image quality. For very small pixels, noise, dynamic range and low light performance suffer. Pixel size is rarely given in camera spec sheets: it usually takes some math to find it. If the sensor type and the number of horizontal and vertical pixels (H and V) are available, you can find pixel size from the table on the right and the following equations. 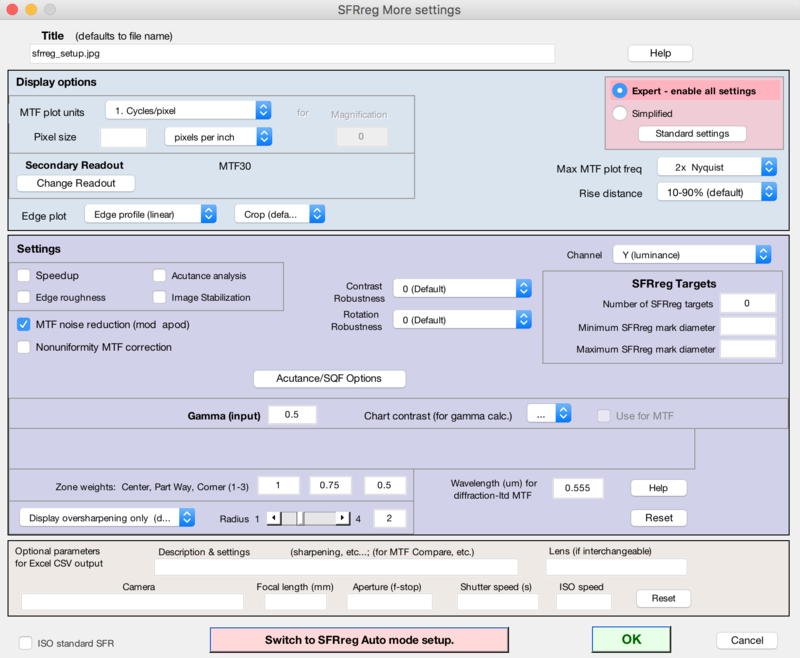 Pixel size in microns (microns per pixel) can be entered directly into the SFR settings box. Example, the cute little 5 megapixel Panasonic Lumix DMC-TZ1 has a 1/2.5 inch sensor and a maximum resolution of 2560x1980 pixels. Guessing that the diagonal is 7 mm, pixel size is 2.1875 (rounded, 2.2) microns.You can find detailed sensor specifications in pages from Sony, Panasonic, and Kodak. (Type) Diagonal mm. Width mm. Height mm.